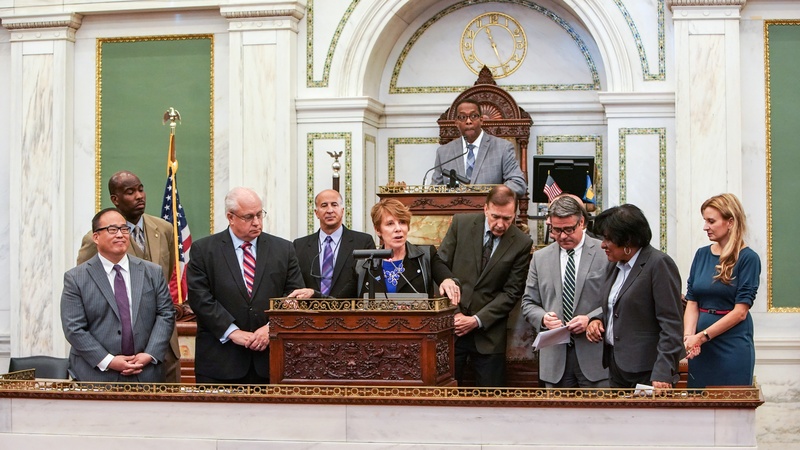 Earlier this month, Philadelphia Councilmembers Bobby Henon and David Oh adopted a resolution congratulating and recognizing Comcast NBCUniversal for its commitment to members of the military, veterans and their families, and for being honored by the Secretary of Defense as a 2017 Employer Support for the Guard and Reserve Freedom Award recipient, the highest recognition given by the U.S. Government to employers for their support of employees who serve in the Guard and Reserve. The ceremony took place at City Hall on November 2. Comcast Senior Vice President of Military and Veteran Affairs Carol Eggert, a retired U.S. Army Brigadier General, accepted the honors on behalf of Comcast NBCUniversal. Comcast NBCUniversal has hired more than 13,000 members of the military community since 2010. The company supports employees who choose to continue their service while pursuing a career, providing benefits specifically for National Guard and Reserve members that allow them to take annual time off to meet their military requirements, as well as supplemental pay and health and welfare benefits for up to three years should they be called to active duty service. To learn more about our commitment to the military including recent efforts, click here. Carol Eggert, Comcast Senior Vice President of Military and Veteran Affairs, proudly accepted the honors on behalf of Comcast NBCUniversal. Philadelphia Councilmember Bobby Henon announcing the resolution recognizing Comcast NBCUniversal for it’s military commitment. Ceremony at City Hall, November 2, 2017. Councilmember Bobby Henon with Comcast’s Senior Vice President of Military and Veteran Affairs Carol Eggert.